Beauty Buzz: New Makeup By One Direction. One Direction is not only one of the world's most famous musical groups but are tapping into the beauty world as well with their new makeup line that are sure to send their fans into a craze. Makeup from One Direction is fun, bold, often irreverent, with a touch of cheeky mischievousness. It's a range of makeup and cosmetic products that celebrate youth and style with bold shades, unique formulae and is offered at prices that every girl and woman can afford! Makeup from One Direction is available in three keepsake tins/ limited edition collectable packaging inspired by One Direction's globe-conquering albums; "Up All Night", "Take Me Home" and the latest chart topper, "Midnight Memories". All your beauty essentials are housed in the collectable keepsake tin with removable sleeve, complete with ONE DIRECTION doodle stencils to decorate your keepsake tin and to make it uniquely your own. Each tin also comes complete with everything you need to show off your personality, whether you're a a rock and roll girl, a fun party girl or the girl next door. It also includes illustrations to show you how to get your perfect look. We got to sample the "Up All Night' makeup kit for the Looks Collections, which includes a liquilights pink glow gloss, a 4+1 eye shadow palette, bubblegum pink creme lipstick, volumizing mascara in perfectly black, aqua blue metallic chrome nail varnish, dark denim eye and body crayon and a 5 piece decorator stencil set. 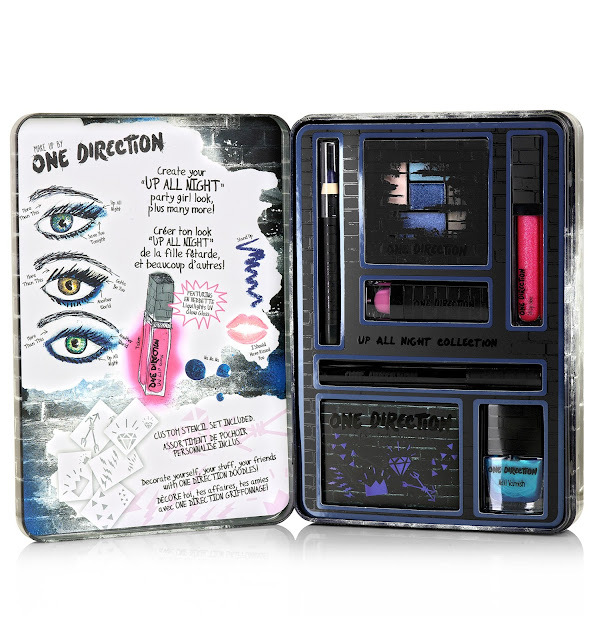 Makeup by One Direction "Up All Night' makeup kit. One Direction's new makeup line created by Markwins Beauty will be available worldwide, starting in the U.S on the dates and at the retailers listed below. 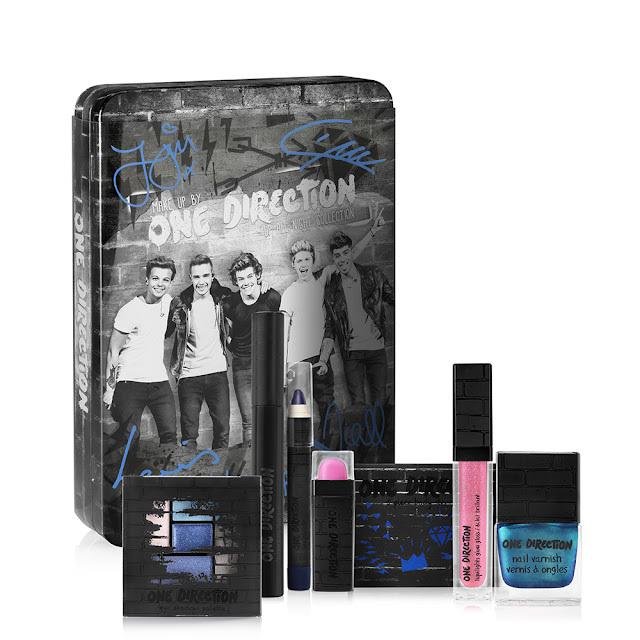 In the mean time you can learn more about One Direction's makeup line by visiting the Facbeook page. This beauty buzz post is brought to you by One Direction and Markwins.